2015 is the UN International Year of Soils and aims to increase awareness and understanding of the importance of soil for food security. One of the specific objectives for the year is capacity enhancement for soil information collection and monitoring, and recent Crawford Fund support for workshops on soil fertility analysis will hopefully assist a range of South East Asian countries with their interpretation of soil testing. Two workshops on soil fertility analysis, led by Dr Philip Moody of the Queensland Department of Science, Information Technology and Innovation (DSITI), were held in Thailand throughout August this year. The first workshop, held in Cha Am at the ‘Sustainable Uses of Soil for Food Security’ conference, included participants from Thailand, Indonesia, Vietnam, Lao and Cambodia. The overall objective was to agree on key soil fertility analyses to be undertaken by selected labs — a crucial step in managing soils for sustainable agricultural systems. “Having all labs in the South East Asian Laboratory Network (SEALNET) and ASPAC inter-laboratory sample exchange programs undertake the same analyses maximises opportunities for improving Quality Assurance (QA) and Quality Control (QC) processes”, said Dr Moody. The second workshop, ‘Soil Fertility Assessment by Quality-Assured Soil Testing Laboratories’, was held at the Phetchaburi Land Development Department (LDD) field station. This workshop focused on QA/QC procedures currently used in the labs, and the need for interpretation guidelines for the soil analysis results. 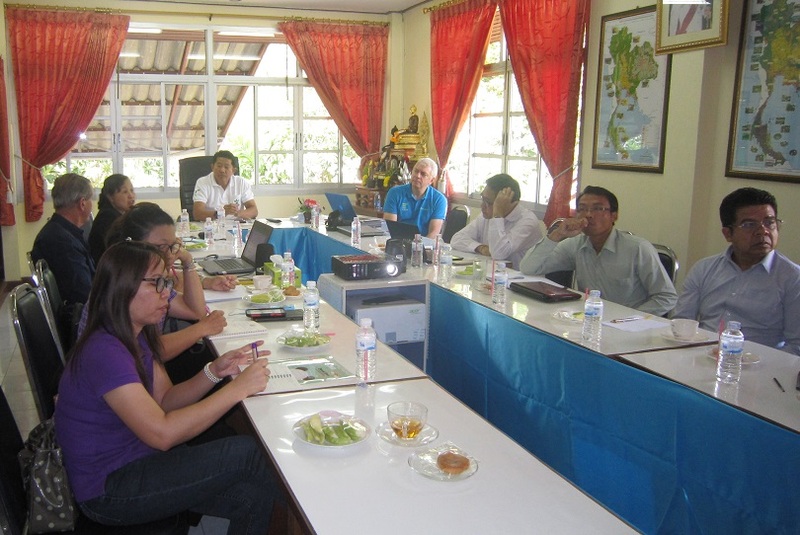 Participants of workshop 2 at Phetchaburi Land Development Department field station. It became apparent at the workshop that while QA/QC processes have progressed well in all labs, the lack of soil test interpretation guidelines is still a major limitation to the usefulness of the soil results to the end user. “It was found that most labs simply reported values, with no attempt to engage with the end-user in their interpretation”, said Dr Moody. Regional soil testing labs do not currently provide interpretation guidelines when reporting analyses to clients. The workshop participants agreed that providing such information would greatly increase the impact of soil testing as a valuable decision support tool, as well as increasing the value of the labs in the eyes of their clients. LDD recognised this as a major problem and all participants were in support of establishing credible and referenced guidelines — as a high priority for SEALNET. “We intend to follow up this issue and work towards developing a set of SEALNET interpretative guidelines”, said Dr Moody.